In my work with B2B organizations, the question of how to use Facebook is invariably front and center. This Is despite the fact that numerous surveys have shown that Facebook is one of the least effective social networks for B2B marketing. In a survey of marketers conducted by BtoB magazine last year, Facebook was ranked last in usefulness among the top five social networks, trailing blogs, LinkedIn, YouTube and Twitter, in that order. Nevertheless, some B2B companies have mined gold out of Facebook’s audience, particularly for recruiting young college graduates. Let’s look at some examples of what they do well. 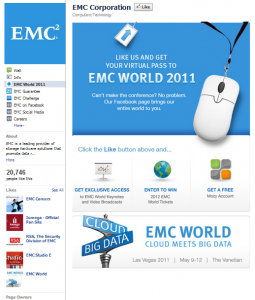 Storage maker EMC makes particularly good use of Facebook’s “Welcome” page. This is an under-utilized tool that enables companies to present an HTML page as their default front door. It’s done with an application called Static FBML (Facebook Markup Language) but there is little difference between FBML and HTML. The advantage of a Welcome page is that you can use all the tricks of an HTML page, including hotspots, embeds and even forms. Buddy Media uses it to capture leads, as does e-mail marketing provider Infusionsoft. SAP plays inline videos. Use welcome pages to present an attractive and exciting introduction to your company. EMC has several FBML pages, including a list of its other social media accounts and a game you can play only after liking the page. EMC doesn’t use Facebook’s wall to much effect, but its purpose seems more promotional than interactive. On that front, it hits the mark. LinkedIn is all about efficiency, but Facebook is about generating discussion, even if it’s around trivial things. For interactivity, it’s hard to beat Intel’s page, which has racked up nearly 2.7 million likes*. Intel uses its wall to great effect. Its language is perfect for the young Facebook audience, and its questions and challenges are often offbeat and fun. “It’s 2026…what are your devices able to do?” Intel asked last week. Nearly 1,100 people have responded. Wow. Earlier in the week it used an in-line poll app to ask “What content are you most excited to see on our Facebook page?” Interestingly, videos and product announcements topped the list. Cisco is also terrific at generating discussion. A post on Monday offered fans the chance to win a Casio camera by telling how the Cisco Unified Computing System can benefit their business. That’s a great way to generate word-of-mouth, because posts are shared with people’s friends. Contests and giveaways work well on Facebook. Cisco also has a clever concept called the SuperFan, which is a recognition awarded to their most active visitors. There’s no money involved: SuperFans get their name and face on the Cisco page, and that’s good enough for many of them. Here’s how it works. Salesforce.com leverages Facebook to drive attendance to its many events. The company knows that its core audience is sales professionals, and it uses discounts, referral bonuses and contests to reach these individuals. Salesforce also post lots of photos of people, which reinforces the image that this is a company with a personal touch. One of the most popular uses of Facebook for B2B companies is as a recruiting tool. Facebook has an app to support career postings on your page, but some companies take it to the next level. UPSjobs goes beyond simply posting job opportunities. It makes the extra effort to quickly respond to inquiries from its fans, often within a few hours. As a result, UPS has turned the tables on traditional recruitment: People come to its page seeking jobs because they know they’ll get a rapid response. As a result, most of the wall comments are from people who want to work for UPS. Microsoft celebrates its interns on its recruiting page, which is a smart move given the young demographics of the Facebook audience. Sodexo is a master of using social media for recruitment. It uses apps for Twitter, YouTube, Flickr and Foursquare to pull its content from other social networks into Facebook. This company’s entire recruiting effort – it hires about 5,000 people in the US every year – is built on social media. Check out its impressive recruitment site, which lists the many social channels it uses. Other notable careers pages on Facebook include Shell, Hilton and Abbott Laboratories. Have fun. I think of Facebook as the after-hours social network. The style that works best is relaxed, informal and a little edgy. Be personable and distinctive. No company does this better than M&M Mars, whose Skittles page is closing in on 19 million likes. Its style is unique: funny, unpredictable and tuned to generate response. Respond. Facebook is a place for conversation, not publication. If people ask questions, you need to respond and quickly. One common mistake companies make with their Facebook pages is to launch them and leave them. Successful fan pages feature a constant stream of new posts by the company and quick response to visitor comments. Be Colorful. Welcome pages are one of the big differences between Facebook and LinkedIn. They enable you to add a colorful and multifaceted dimension to your presence. The best welcome pages have lots of entry points and a vigorous, hip feel. Share. One aspect of Salesforce.com’s Facebook presence that I particularly like is its willingness to share content from other sources that its audience may find useful. This not only makes the Salesforce.com fan page a resource but builds goodwill with the sources it links to. Ask. 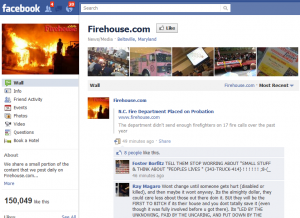 Firehouse.com has built an impressive Facebook presence for its audience of firefighters and emergency medical technicians. “Is your department participating in National Night Out?” It asked earlier this week. It’s “Sunday Morning Roll Calls” sometimes generate hundreds of responses. Something as simple as asking people what they plan to do for the weekend can create interaction. * I’m personally not a big fan of tracking page likes as a measure of success, particularly since Forrester has estimated that less than 15% of people who click that button ever return. What impresses me more about Cisco’s Facebook presence is the number of likes and comments that individual wall posts receive. This entry was posted in B2B, communities, Facebook, marketing, Tips and tagged Abbott Laboratories, cisco, EMC, FedEx, Firehouse.com, Hilton, Intel, Lenovo, Microsoft, Shell, Skittles, Sodexo, UPS, VMware by Paul. Bookmark the permalink. I have not found FaceBook to work well for my B2B clients, infact, i did a little survey through our staff, asking over 50 people who followed a company only 5 said yes, mainly these companies were fashion retailers! yes it was the gils! I am going to use this info and give it a go again and see if i can get some faith back into social media for my clients.